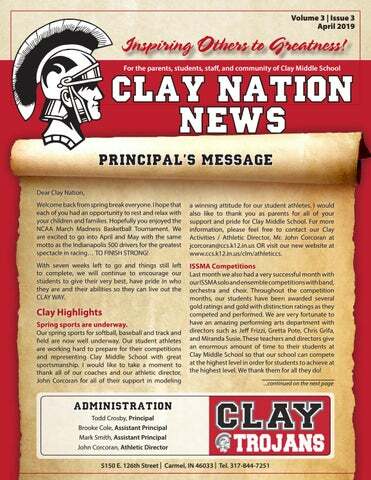 PRINCIPALâ&#x20AC;&#x2122;S MESSAGE Dear Clay Nation, Welcome back from spring break everyone. I hope that each of you had an opportunity to rest and relax with your children and families. Hopefully you enjoyed the NCAA March Madness Basketball Tournament. We are excited to go into April and May with the same motto as the Indianapolis 500 drivers for the greatest spectacle in racingâ&#x20AC;Ś TO FINISH STRONG! a winning attitude for our student athletes. I would also like to thank you as parents for all of your support and pride for Clay Middle School. For more information, please feel free to contact our Clay Activities / Athletic Director, Mr. John Corcoran at jcorcoran@ccs.k12.in.us OR visit our new website at www.ccs.k12.in.us/clm/athleticcs. With seven weeks left to go and things still left to complete, we will continue to encourage our students to give their very best, have pride in who they are and their abilities so they can live out the CLAY WAY. Clay Highlights Spring sports are underway. 2 Inspiring Others to Greatness! PRINCIPAL’S MESSAGE continues... Education is a People Business – Together We Are Better! Food Service Appreciation Week - Thank you to Amy Glover and our Food Services Department. National Library Week – Thank you to Stephanie Swartzendruber and Carole Fitzgerald for all they do in our Clay Media Center for all students and staff to promote the love of reading and writing. At Clay, we believe that by showing appreciation to others, it allows us to better understand that it truly takes all of us working together to achieve success. There are a lot of people to thank on a daily basis for all the work they do here at Clay to make sure Clay remains a great school and these are just a few of them. During the month of March, we took time to recognize National Disabilities Awareness Week. Our Clay Best Buddies Program (under the direction of staff members Erin Mayer, Mary Walstrom and Leyla Niese) and our students developed a special week dedicated to various disabilities. We had some activities and information regarding those disabilities and the overall objective was to educate and bring more awareness of various disabilities to everyone in our school, both students and staff. A special thank you goes out to our World Language Department for doing an amazing job creating a World Culture Week at Clay. We currently have approximately 38 different cultures represented here at Clay throughout our building and we offer French, German, and Spanish as languages. This department planned different spirit days, did announcements to the entire student body giving information about various cultures and even worked with our Clay Food Services Department to plan daily meal offerings for our students and staff from our cafeteria during lunch. Thank you to Mrs. Glover – Clay cafeteria manager for all her and her team’s hard work. As we look to transition our incoming fifth-graders to middle school life and we continue to prepare and transition our eighth graders to Carmel High School, we must make the most of each day so that this eighth grade class looks back on their middle school experience with special memories of Clay. Along with these major transitions occurring, we still have a full slate of activities for you as parents to take full advantage of this spring. These activities include performing arts concerts, club competitions and our sports teams in action. I challenge all Clay Trojans to Inspire Others to Greatness and together we will take Clay Middle School to even greater heights. As principal, I believe it is my position to help provide vision, leadership, oversight, safety and the best instruction to every student that attends Clay Middle School. I truly realize that success cannot be accomplished without an active school community to continue to take Clay Middle School in the direction of continuous success and excellence. I am happy to announce that the Clay Nation is alive and well. 3 FINISHING STRONG We are rapidly approaching the end of the 2018-2019 school year. Right now, the focus of your student should be on a strong finish and you can help. Your attention and involvement in this effort will reinforce the importance you place on your child’s education. Please take the following steps to support your student during this critical time. 1. Reinforce positive and successful school habits. Attention in class, homework, test preparation, and attendance are key factors. 2. Access and review your student’s progress, attendance, and test schedules on Parent Portal. 3. Help your student to create a plan to improve current weaknesses and prepare for final exams. 4. Be aware of tutoring and study assistance classes available at the school and encourage your student to participate. 5. Re-establish your student’s home-study routine. 6. Help your student to stay focused. ‘Coasting’ is a natural, but deadly tendency. Your involvement is a tremendous positive factor for a strong finish. Your interest, willingness, and dedication to helping your child succeed provides an unmistakable message. Your child will thank you for it - someday. If you are new to Clay Middle and would like to meet other new families, join the New Families Gathering Group. This group meets frequently to share resources and information with new families about Clay Middle School and the Carmel community. Please email Jenny Fuller (jmml@att.net) for further details and to learn the locations of upcoming gatherings. 5 PASSPORT PROGRAM Team Apollo students spent Quarter 3 traveling the world through the outstanding Core+ presentations of their peers! We had students who have lived in Armenia, Belgium, China, England, Egypt, Guatemala, New Guinea, Pakistan, Taiwan and Venezuela prepare presentations and answer questions from their peers. One of the most awesome parts of this project is that all of the kids who participated did so of their own accord- there were no grades attached to their presentations or attendance. To celebrate their efforts, we hosted an International Feast and Activity Party during the Core+ before Spring Break. CLAY SRA GIVES BACK AT GRACE CARE CENTER Over 100 Clay student leaders volunteered at the Grace Care Center in March to give back to the community through several hands-on leadership projects. Students in SRA sorted and packaged diapers, repackaged soda, and organized donations at the center. The field trip was a culminating activity for the group who brought in nearly 3,000 cans for the Grace Care Center during the annual Clay SRA canned food drive in October. Grace Care Center benefits 500 families in Hamilton County each week. For more information about teen volunteer opportunities, please visit http://gracechurch.us/carecenter-volunteer/. WELL DONE! If your student is not planning to attend Carmel Clay Schools for the 2019 – 2020 school year, please email our Registrar, Kaleesha Thompson at kthompso@ccs.k12.in.us for a Withdrawal Form and instructions on where to forward records. Sertoma’s Classroom Winners were as follows: Mr. Anderson – Fallyn R (1-2A); Nick A (34A); Emma H (7-8A); Lauren K (1-2B); & Jewel W (3-4B) Mr. McGuckin – Margaret H (1-2A); Makenna M (3-4A); Chase O (7-8A); Jenna R (1-2B); & Isa L (3-4B) Mrs. Myers – Jessica S (1-2A); *Kirsten J (34A); *Jamey C (7-8A); Fatima I (1-2); & Sienna A (3-4B) *Special congratulations to Kirsten J and Jamey C for being recommended as finalists for the Grand Prize. The Grand Prize announcement will be made on Wednesday, April 10th with a recognition luncheon and award ceremony on May 1st with the members of the Broad Ripple Sertoma Club. 7 PREVAIL'S HERO OF THE MONTH, CHRISTOPHER KLEMAN! Prevail is pleased to recognize Christopher Kleman, teacher at Clay Middle School, as Prevailâ&#x20AC;&#x2122;s Hero of the Month. Chrisâ&#x20AC;&#x2122;s dedication to teaching and his connection with his students are inspiring. Along with his wonderful teaching style and capabilities, he continues to support Safe Dates in his classroom. While Safe Dates is being taught in his classroom, he is always willing to jump in and drive a concept home for his students. His strong support for the program and Prevail is appreciated. His students see the support he provides and that means a ton! We are lucky to have great teachers who support Prevail in the prevention of dating violence. Without him and other dedicated teachers, we could not do what we do for 8th graders in Hamilton County. ALL medication, both prescription and non-prescription, must be transported to and from the clinic by a parent or guardian. Students are not permitted to have any medication or drug in their possession. STATE MATHCOUNTS COMPETITION Congratulations to Daniel Tian, Nate Martin, Michael Qian, Alex Tang, Zachary Guo, Eric Yang, Christopher Xu, David Jiang, and Harry Zheng who competed in the Indiana State MathCounts competition at Purdue University on Saturday, March 9, 2019. The team of Christopher, Harry, Daniel, and Michael came in fourth overall. Harry WON the countdown round and came in second individually out of 221 state competitors. This qualifies Harry to travel to Orlando in May to compete in the NATIONAL MathCounts competition! CLAY CALENDAR https://www.ccs.k12.in.us/clm/about/calendar?cal_date=2019-02-22 Be sure to check out upcoming sporting events and other school activities on the Clay calendar. Each quarter Clay AVID students nominate their core and elective teachers for the AVID Teacher of the Quarter award. Teachers are nominated for their use of writing, inquiry, collaboration, organization, and reading (WICOR) strategies in the day-to-day happenings of their class. This quarter, AVID students selected Kristi Myers (6th grade), Katie Russo (7th grade), Sean McVey (8th grade), and Jeff Frizzi (Electives) as the recipients of this honor. Students from the AVID Council facilitated the award ceremony at the March faculty meeting. Congratulations, teachers. Thank you for your commitment to using AVID strategies in the general classroom. 10 Inspiring Others to Greatness! FOOD SERVICES IS HIRING CLUB CALM Club Calm provides an opportunity for any interested student to quietly sit and relax as a group while further developing mindfulness and emotional intelligence. All are welcome and we hope to see you there! When:	Mondays, last 10 minutes of each lunch period Where:	Room 231 Questions? Please email Michelle Janson at mjanson@ccs.k12.in.us. BUS PASS If your student will be riding a different bus home – with a friend – they must bring a parent-signed note into the front office, first thing in the morning. We will create a bus pass that the student will give to the bus driver. Thank you! Carmel Clay Food & Nutritional Services is hiring Food Service staff to work in our school cafeterias. Currently, we have several 4-6 hour positions available, paying $12.97/hour. Food Service staff are hired as substitutes before being considered for permanent positions. If interested, please visit the Carmel Clay Schools webpage, under the Careers tab. https://www.ccs.k12.in.us/careers Thank you for your interest in employment with Carmel Clay Schools. 11 21ST CENTURY SCHOLARS 21st Century Scholars is a scholarship which provides eligible students up to four years of undergraduate tuition at any participating public college or university in Indiana. If you attend a private college, the state will award an amount comparable to that of a four-year public college. 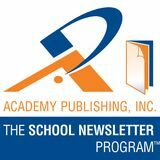 To enroll your a scholar or learn more visit http://scholars.in.gov/parents/enroll/. Reminder: In order to participate in any sport at Clay your student must have an athletic physical on file with the main office. The athletic physical needs to be completed after April 1, 2019 to be valid for the 2019-2020 school year. In addition to the athletic physical, a parent/guardian needs to complete the on-line athletic consent form (https://www.ccs.k12.in.us/ clm/athletics/required-forms). 13 ILEARN Dear Clay Families, The new state assessment ILEARN will be starting this month on April 22. Please make sure you do your best to avoid appointments or absences for the dates and times listed below. ILEARN testing is throughout the school day in our computer labs/ classrooms. Below are the testing times for each grade and helpful ILEARN tips. (CAT) = Computer Adaptive Tests. Individualizes the test for students based on responses. Assesses students’ knowledge of on-grade-level content. (PT) = Performance Tasks. An authentic task that encourages complex student engagement. (FF) = Fixed Form Tests. Every test contains the exact same items. ***ILEARN assessments are all untimed. The IDOE does give suggested average testing times, which is the reason for the large testing windows of time. Make sure your child receives a healthy breakfast each morning Make sure your child is well rested so he/she is prepared for testing Encourage your child to relax and to view the test as a chance to show what they have learned. Reassure them that it is natural to feel a little nervous and that the important thing is to try their best. As we look to ahead in preparation to the new ILEARN test, here are a few things that you can do to help your child be as successful as possible. Be prepared - Cramming for any test is never the best way to prepare. Keep up with your homework and ask your teachers for help when you need it. Ask for help - If you’ve had trouble with standardized testing in the past, ask a teacher, counselor or parent about extra help now. Review - Try to take it seriously when your teachers review important information that may help you feel more prepared. Double-check your work - Get in the habit now of double-checking your work and proofreadingyour answers on homework to be ready to find mistakes on test days. Get plenty of sleep - Go to bed a little earlier so you get a good night’s sleep. Being well rested will give you an extra boost of energy. Have a good breakfast - Eating a healthy breakfast will help you perform better. Too much food can make you feel sleepy, so don’t overdo it. Take a break - Get some exercise during your breaks or after school to keep your energy up. Stay connected - The best preparation is to provide consistent support for your child throughout his or her education. Know what’s expected - Read information available at Indiana Department of Education (https://www.doe.in.gov/) so you know what your child should know and be able to do, reinforce these expectations at home and stay connected to your child’s academic performance throughout the year. Check grades - Your son or daughter may say things are “fine” at school but don’t stop checking Canvas, progress reports or, if available, your child’s online grades or class progress. Check Canvas / Team Newsletters for updates - Teachers know how hard students are working, the quality of their homework and what areas need improvement. Stay involved. Nothing will have a bigger impact on your student’s success than your involvement in his or her education. If your child is not studying at home, ask why, and double-check with teachers. It’s tough to hold the line, but making sure your child does get the proper amount of rest and eat properly is important for academic success as well. Ask for help. Students who are struggling in a particular class may need extra help after school or with a tutor. Find out from your school where you can go for help and make sure your student gets the help he or she needs. Catching a problem area now can make a big difference. Please feel free to contact the school if you have any major questions or concerns on how to best support your child.